HARLINGEN — Antonio Garcia suffered chronic pain from a decades-old knee injury. Laura Vela says the pain in her stomach from chronic gastrointestinal problems was almost unbearable. Both are Rio Grande Valley veterans. And both found relief from their pain last year after the Harlingen Veterans Affairs clinic referred them to private sector doctors out in the community. This week, the two stood directly behind President Donald Trump in a ceremony in the Rose Garden at the White House. 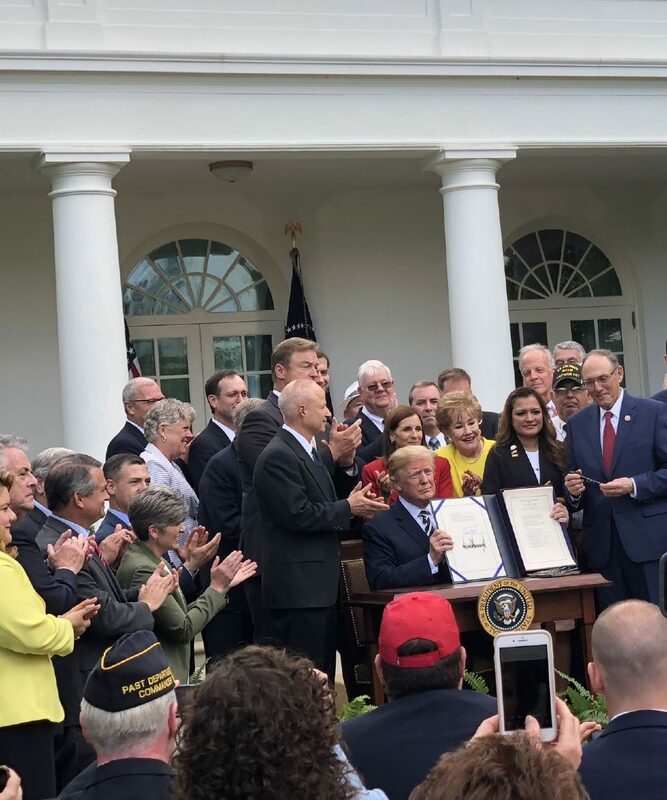 They were looking over the president’s shoulder as he signed a bill that will greatly expand access for veterans to VA-funded care in the private sector. “This is a great step forward for our veterans because now they will not have to travel all the way to San Antonio for their specialty care,” said Vela, 42, a U.S. Army veteran who lives in Harlingen. Garcia, 70, an Air Force veteran from Brownsville, said he doesn’t know the details, but he thinks it’s a great law. “Once the program is rolled out and it’s explained to the veterans, I think they’re going to be very happy with it,” he said Wednesday in a telephone interview from Washington, D.C. The law expands the so-called VA Choice program, which Garcia and Vela both say they benefited from. Details of how and when the new law will be implemented still need to be worked out. But the measure is aimed at reducing wait times and improving veteran care by steering more patients to the private sector. At the Rose Garden ceremony at the White House on Wednesday, Trump praised the legislation as fulfilling his pledge to fix the Department of Veterans Affairs by bringing accountability and providing private care to veterans when they feel they need more than government-run health care. The VA Choice program passed in 2014 in response to a wait-time scandal at the Phoenix VA medical center, where some veterans died while waiting months for appointments. This new law builds on that program. It would loosen Choice’s restrictions, which limit outside care to only when a veteran must wait 30 days for an appointment or drive more than 40 miles to a VA facility. Currently, more than 30 percent of VA appointments are in the private sector. It will now be up to VA officials to draw up regulations under the law. The local VA clinic also has had its problems. Last year, the VA Health Care Center at Harlingen was the only veterans medical facility in the state which received a lower score on care factors from the previous year, records show. The Harlingen facility, one of eight VA hospitals in the state, earned the lowest possible score of a “one” rating in rankings known as Strategic Analytics for Improvement Learning, or SAIL. In 2016, VA officials in Harlingen blamed the facility’s low rating — a “two” — on long-running vacancies in key management positions at the medical center. They also mentioned difficulties with nursing staff retention. But Garcia and Vela both give the Harlingen VA clinic high marks for care. At the time Garcia injured his knee in 1969, there was no VA clinic in Harlingen. Years later, as he was suffering chronic pain, he would have to drive to San Antonio for care. Then the VA clinic opened in Harlingen and he was able to get treatment here. “They (VA clinic) sent me to an outside provider and they told me my knee was totally gone and it needed to be replaced,” Garcia said. The Choice program offered three or four doctors and it was up to him to choose one. Last year, his knee was replaced by a private sector doctor in Harlingen. “They replaced my knee and they did an excellent job,” he said. He also has nothing but high praise for the VA clinic here. “They’ve done an excellent job as far as I’m concerned. They’ve gone above and beyond to make sure I get all the medical help I need,” he said. Vela also says the VA Choice program worked for her. She was told she needed to see a gastroenterologist, or “GI doctor.” But Harlingen VA clinic officials didn’t know if they would have such a specialist available for six months to a year. She was told she could go to the VA facilities in San Antonio. Or seek help from a specialist in the local community. “I had so much pain in my stomach, I could not wait,” she said. The Choice program gave her options of local providers, and she chose Women’s Hospital at Renaissance. Expanding the Choice program, she said, will help more veterans like her, Vela says. “The VA doesn’t offer a lot of the specialty services that we have out in the community. So this (law) would extend more services to our veterans,” she said. Ed Asher is the Night Editor for the Valley Morning Star. He can be reached at easher@valleystar.com or (956) 430-6290.